Aggregate Crushing value is a measure of the strength of the aggregate. The strength of concrete largely depends upon the strength of aggregate. The aggregate should therefore have minimum crushing value. The aggregate crushing value provides a relative measure of the resistance of an aggregate to crushing under gradually applied crushing load. The aggregate crushing value test is a useful guide when dealing with aggregates of unknown performance, particularly when lower strength is suspected. 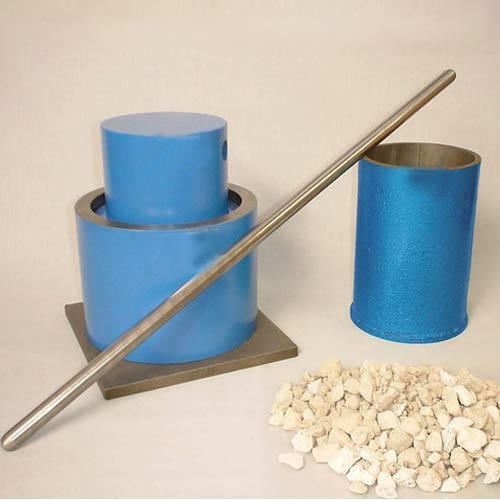 To find out the performance of aggregates for various uses, 7 types of lab test are available. One of the test in which concrete material can fail is due to crushing under compressive stress. Aggregate crushing test is standardized by IS: 2386 part-IV and used to verify the crushing strength of aggregates. The aggregates should be oven dried, which can passes through 12.5mm and retained on 10mm sieve. The cylindrical steel cup is stuffed in three layers of aggregate. Each and every layer is tamped with 25 strokes by the rounded end of tamping rod. The surplus aggregate should get struck off by the tamping rod from a straight edge. The net weight of aggregate in the cylindrical steel cup is measured to the nearest gram (W1). The surface of the aggregates is leveled and the plunger is inserted. Consequently the plunger rests horizontally on the surface. The whole apparatus is then placed between the platens of compression testing machine and loaded at a consistent rate so it can reach to a load of 40 tons in 10 minutes. The load is then released and the sample is removed from the cup. The sample is then sieved on 2.36 mm IS sieve until no further significant amount passes in one minute. The crushed aggregates (W2) is expressed as % of the total weight of sample (W1), which is the crushing value of the aggregate. In aggregate crushing test, if aggregate crushing value is less than 10, it signifies an exceptionally strong aggregate. While aggregate crushing value above 35 would normally be considered as weak aggregates. Why Aggregates have an Important Role in Concrete? Previous PostPrevious Can I Build My House Without Leaving Margin? Next PostNext Important Clauses That the Tender Must Have or Must Not Miss!